We use mass spectrometry to test blood. Mass spectrometry is widely viewed as among the most sophisticated forms of analytical chemistry and is positioned towards the top of most metrology hierarchies. Most blood is tested using indirect detection; the signals detected are not generated by the analytes of interest - instead, signals detected are generated by signal generating molecules that are in some way associated with the analytes of interest​ through some reaction between them. With mass spectrometry, the signals detected are directly generated by the analytes. This enhances specificity and directly enables multiplex signal detection. While highly specific and directly multiplexible, mass spectrometry is burdened by ionization suppression and poor sensitivity. These burdens have largely excluded mass spectrometry from routine blood testing and relegated most mass spectrometry blood testing to reference methods that exploit its high specificity and research endeavors that exploit its direct detection. 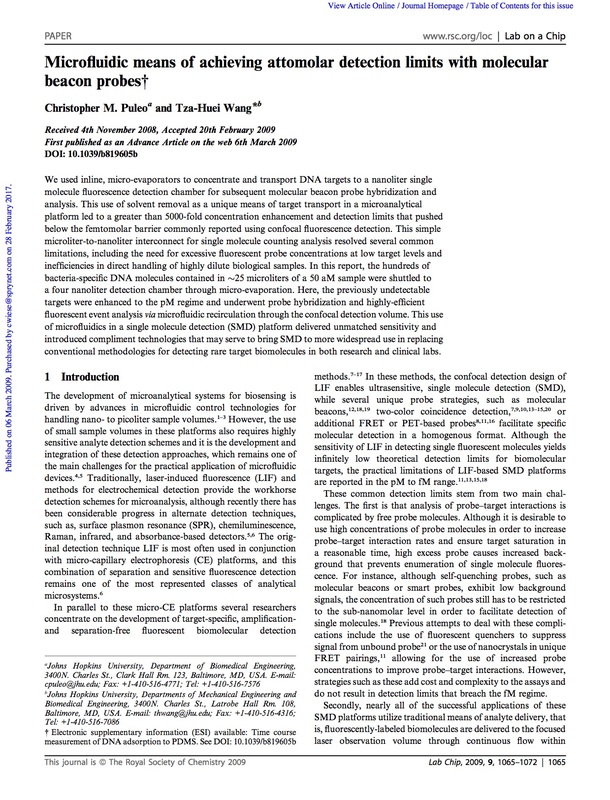 Ionization suppression is particularly challenging to the high complexity of blood and the the very high dynamic range of the plasma proteome; i.e., for each Interlueken 6 protein, there are about 10 billion Albumin proteins!​ Ionization suppression virtually excludes mass spectrometry access to the low abundance proteome without enrichment or isolation. Accordingly, most mass spectrometry blood testing methods require substantial enrichment steps. The dominant form of enrichment is liquid chromatography (LC); in fact, almost all mass spectrometry blood testing employs LC injection. LC is very powerful and useful. Unfortunately, the dominant implementations of LC with mass spectrometry (LC/MS) impose low mass spectrometry duty cycles that result in very high cost behaviors caused by the expensive detector sitting idle around 99% of the time waiting on the LC to deliver the analyte of interest. Further, typical forms of LC suffer from low robustness, such that they impose high downtime costs on the expensive mass spectrometry instrument. While LC is useful and powerful, its ​resolving power is a poor match for the high dynamic range of the plasma proteome. The high abundance proteins such as Albumin are never resolved from the low abundance analytes with LC. As such, the LC peaks containing low abundance protein analytes include non-specific, high abundance proteins that are still more abundant than the analytes. So, ionization suppression continues to burden the targeted analytes. The digestion and affinity capture are optimized forms of typical methods used in plasma proteomics. We use trypsin to digest proteins to tryptic peptides. We use affinity capture to target analytes in the plasma digest. Isolation or enrichment methods typically used in plasma proteomics employ some form of surface (bead or plate surfaces) for immobilization of the immunocomplex for isolation. It has been demonstrated that these immobilizing surfaces non-specifically bind high amounts of high abundance plasma protein residues minimizing enrichment capability [see Item 1]; typical methods only achieve a few orders of magnitude enrichment [see Item 1]. ​Instead of using immobilizing surfaces, we use the large size of the immunocomplex to isolate it from the relatively small molecules of the plasma digest [see Item 2 for proof of concept]. Our production method employs field flow fractionation to isolate the immunocomplex fraction from the plasma digest. No high abundance residues are detectible in the isolated immunocomplex fraction. This is unique to our methods; we know of no other isolation methods in which no high abundance residues are detectible in the isolated fractions [see Item 3]. We have one issued patent that protects this method [see Item 4], and there is additional patentable matter that we can and will claim to further extend our intellectual property protections. Because of our isolation from high abundance residues, we can directly inject analytes into mass spectrometry and, thereby avoid burdening mass spectrometry duty cycle to the constraints of LC elution cycles. ​​ We are developing segmented flow injection to inject samples at high duty cycles [see Item 6]. Surrogate peptide quantitation has primarily been employed in plasma proteomic assays. Clinical precision has been demonstrated by several reference clinical labs for thyroglobulin. Surrogate peptide quantitation precision can be increased by employing multiple isotopes [see Item 7]. Our mass spectrometry methods are subject to fewer pre-analytical errors than typical blood testing methods used in clinical labs. Isotopic internal standard quantitation is much less susceptible to sample contamination and interferences. Surrogate peptide quantitation is much less susceptible to molecular denaturation. With these methods, the processes of blood sample drawing and blood sample transportation have fewer complexities which make feasible important product features including 1) drawing blood at home by self, and 2) transporting blood samples through public mail systems. Figure 6 demonstrates non-specific binding of high abundance residues to immobilizing surfaces. Description of method for achieving 4 to 5 orders of magnitude enrichment of target peptides. 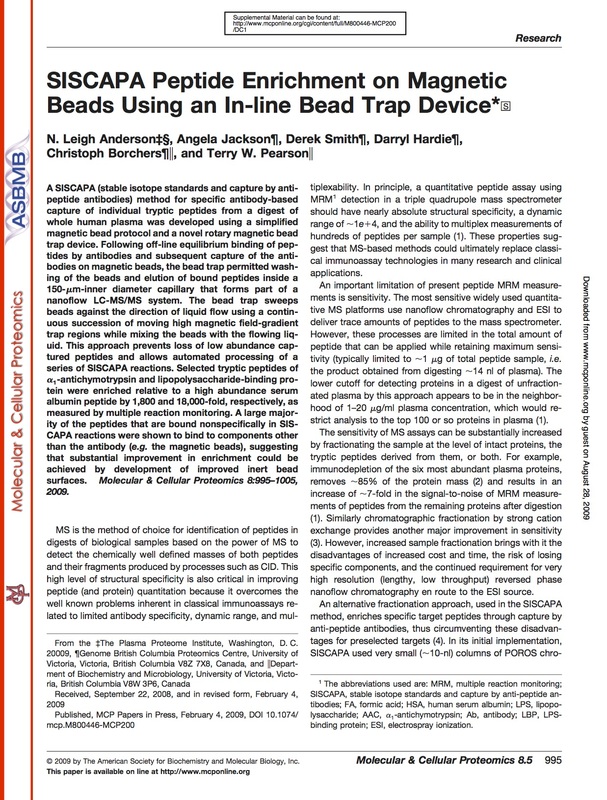 N. Leigh Anderson, Angela Jackson, Derek Smith, Darryl Hardie, Christopher Borchers, and Terry W. Pearson SISCAPA Peptide Enrichment on MagneticBeads Using an In-line Bead Trap Device. Molecular & Cellular Proteomics 8.5 995. Proof of concept demonstrating surface-free isolation of target peptides using ultracentrifugation. Sonja Volk, Thomas D. Schreiber, David Eisen, Calvin Wiese,Hannes Planatscher, Christopher J. Pynn, Dieter Stoll, Markus F. Templin,Thomas O. Joos, and Oliver Pö tz. 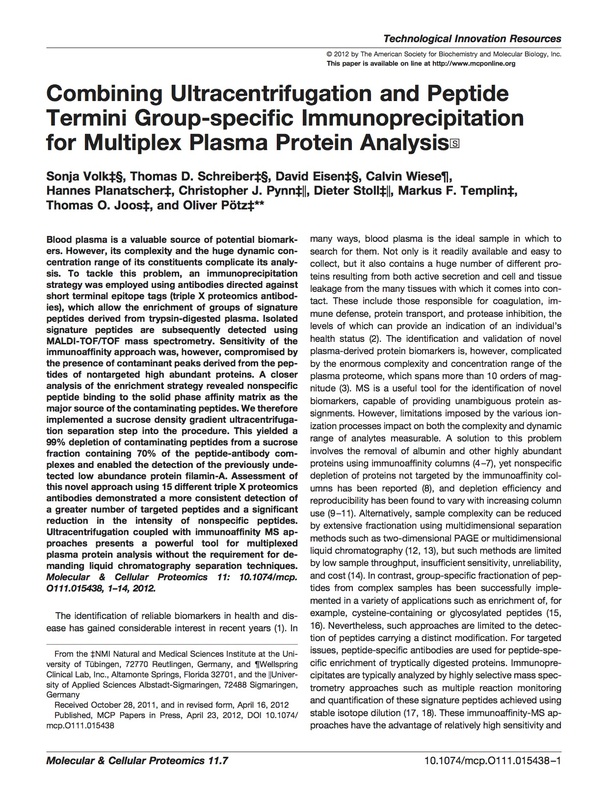 Combining Ultracentrifugation and PeptideTermini Group-specific Immunoprecipitationfor Multiplex Plasma Protein Analysis. Molecular & Cellular Proteomics 11.7. Target peptides isolated from plasma digest with no high abundance residues detectible using surface-free isolation in field flow fractionation channel. Mats Leeman, Benedikt Lang, William Scott, Matilda Storm, Ray Runyon, Calvin Wiese, Oliver Poetz, Thomas Joos. 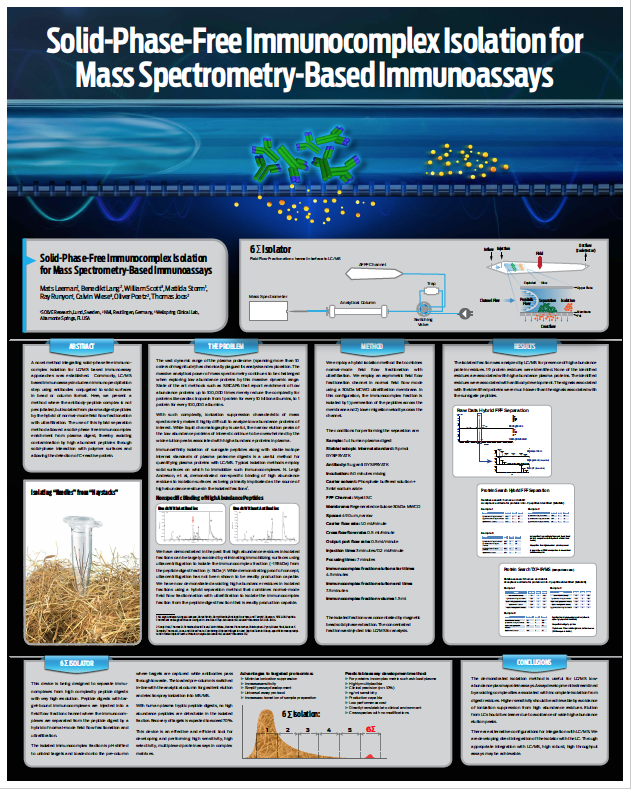 Solid-Phase-Free Immunocomplex Isolationfor Mass Spectrometry Based Immunoassays. The Association for Mass Spectrometry: Applications to the Clinical Lab. 2016 EU in Salzburg, Austria September 13-16, 2016. 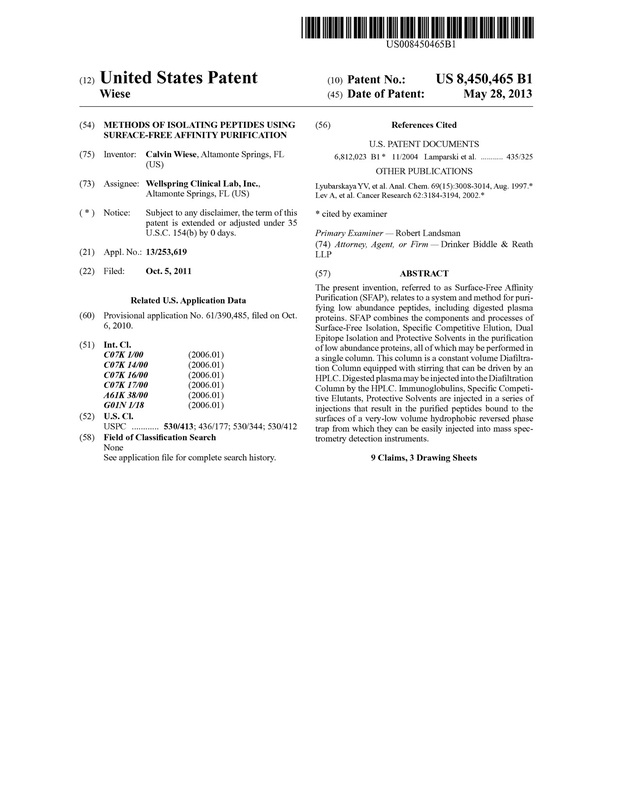 Patent granting claims for surface-free isolation of peptides. Christopher M. Puleoa, Tza-Huei Wang. Microfluidic means of achieving attomolar detection limits with molecular beacon probes. Lab Chip, 2009, 9, 1065–1072 | 1065. Jian Pei, Qiang Li, Mike S. Lee, Gary A. Valaskovic,Robert T. Kennedy. 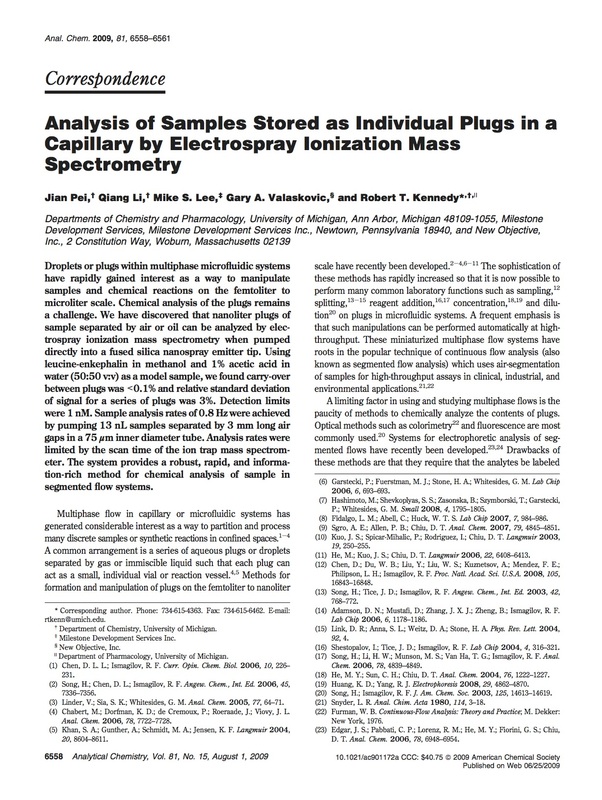 Analysis of Samples Stored as Individual Plugs in aCapillary by Electrospray Ionization MassSpectrometry. Analytical Chemistry, Vol. 81, No. 15, August 1, 2009. Benedikt Lang, Sabrina Fenchel, Calvin Wiese, Oliver Poetz,Thomas Jobs. 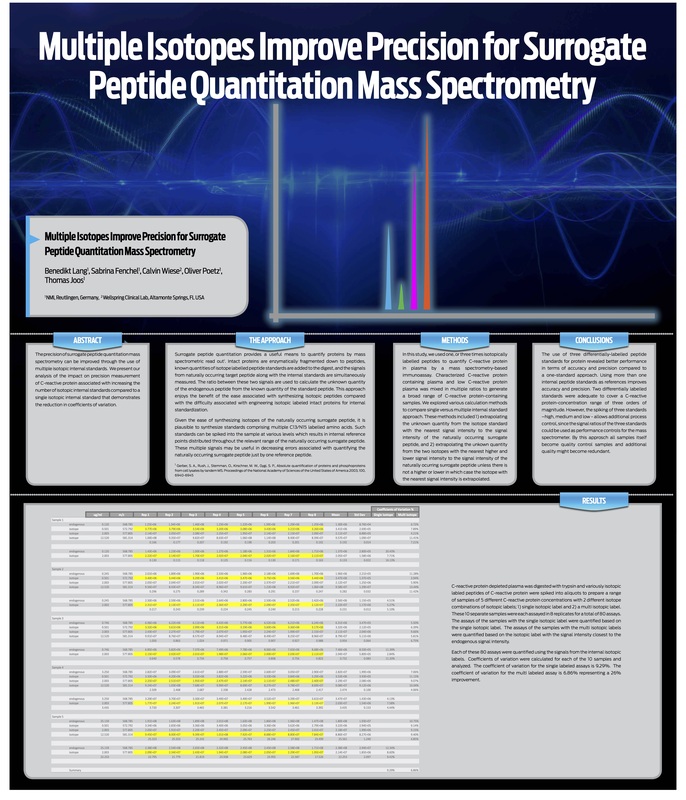 Multiple Isotopes Improve Precision for Surrogate Peptide Quantitation Mass Spectrometry. The Association for Mass Spectrometry: Applications to the Clinical Lab. 2017 in Palm Springs, California January 24-26, 2017.